My first formal job, after switching careers from political analysis to cooking, was as chef and cooking instructor of the Mexican Cultural Institute in Washington DC. This was 2007. A year before, I had created a curriculum that aimed to open, one class at a time, a window into Mexican cuisine, history and culture for anybody living north of the border. What I didn’t know, when I began preparing it, was that classes were to be for a crowd of 100 people, on a stage, wearing a microphone, and having a big screen at my side. I thought it would be small cozy classes for 8 to 10 people in the kitchen. As much as I had culinary training and had done extensive research on Mexican culture and cuisine, I did not have any speaker or media training. I was a bit frozen when I got up on that stage the first couple times. So much so that, for months, before putting the boys to bed each night, instead of telling them bedtime stories, I practiced teaching the classes with them. You bet they know how the recipe for chicken tinga goes! This salad is emblematic of Mexican cuisine. It has unexpected ingredients, unexpected tastes, unexpected textures. It is nutritious and healthy. It is not overly laborious. It is rich. It is fresh. It is generous. It is colorful! It is deeeeeelicious! As I said that day and still say today… in Mexico we have no taco salads. But, oh boy, do we have some amazing ones! Take a peek at the incredible ingredients and combinations that have come from Mexico’s kitchens and are now at your fingertips to enrich your daily life. This year was the 10th anniversary of my live cooking demos and dinners at the Mexican Cultural Institute. It is my 10th year there as its resident chef. It is my 10th year working with the same amazing cooking team and the fabulous staff and the Institute’s leadership. And we have attendees who have not missed a single event in these 10 years! I couldn’t be more honored and proud. I hope to be able to continue this journey along with all of you as the years pass. I end this post, the last one of 2017, with lots of love and gratitude for letting me into your home, via this blog, my recipes or because you tune in to my show. Combine the vinegar, honey, salt, and pepper in a small bowl. Slowly add the oils in a thin, steady stream, mixing with a whisk or a fork until emulsiﬁed. 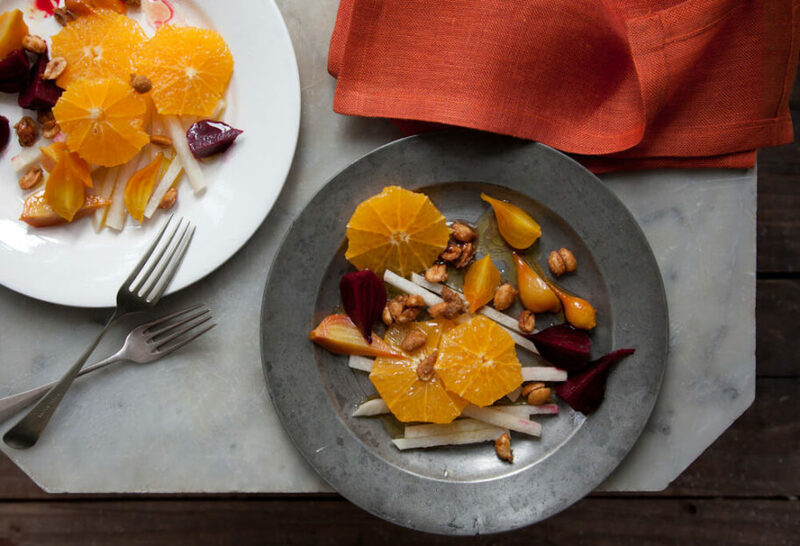 Place the jicama, beets, and oranges in separate bowls and toss each with about one third of the vinaigrette. Arrange the ingredients in a pattern on a large platter. I like to do parallel stripes, and I often start with beets in the center, placing jicama on one side and oranges on the other. Sprinkle on the caramelized peanuts and drizzle any remaining vinaigrette on top. * Note: To cook beets, cut off the greens and most of the stems, leaving about 1 inch. Don’t scrub them or cut off the thin root, or they will bleed their juices, sweetness, and color as they cook. Place them in a pot, cover with cold water, and bring to a boil, then lower the heat, cover, and cook until tender. Medium beets (about 2 inches in diameter) cook in 30 to 35 minutes. For this salad, you want them crunchy, so don’t overcook. Drain, let cool completely, then peel and cut. My daughter lives on DC and misses a lot of the ingredients needed for good Mexican food. Is there a good Latin market on DC? Thank you for your wonderful show. I love it and also reading your story! H Mart, and Mega Mart. Happy New Year! I made your Ensalada de Natividad as a starter course for our Christmas Day dinner with friends here at our home in Northern California’s Sonoma/Russian River Wine Country…. WHAT A HIT IT WAS!!!! Everyone fell in love with the combination of tastes, and the visual presentation on their plates. One thing I did add was a tablespoon of grainy German mustard to the dressing. It added a bit of piquant to the taste, and the graininess added another visual element. Thank you sooo much for sharing your recipe…. after dinner, I had to print it out, as everyone insisted they wanted it to take home. What a huge compliment! That’s a great addition, and I’m so glad everyone loved it! Pleased to find you, your inspirational story, and fantastic, tasty recipes on your site Patti. I’m so glad you discovered the show and website! I love to watch your television show it is very inspiring. I want to reach into the television and taste all the beautiful food. I would love to buy your two recipe books please but I cannot find them. Please let me know how and where I can obtain your two books. You can find them at Barnes and Nobles or on Amazon https://www.amazon.com/Pati-Jinich/e/B00C5URXXU/ref=dp_byline_cont_ebooks_1 I hope you enjoy them! Vamos a tener todo el sitio en español en un par de semanas. Llevo tres años en Oregon por college y verte y recrear the recetas junto con las Mia’s ha sido mi salvacion! Donde puedo comprar ollas de barro?? He encontrado varias en california pero dicen state of california warning… y veo en tu cocina vajillas bellisimas como con las que creci. Donde puedo encontrarlas? Gracias Pati! I will be making this for our family this holiday season. Feliz Navidad y Ano Nuevo. Keep on sharing our wonderful foods and culture. The next time you plan a culinary trip to Mexico, please take us with you. Your shows on PBS are fantastic. Many blessings! Feliz Navidad from Nuevo Mexico Pati ! We LOVE your show ! We’re going to serve this tonight with our traditional posole. What a delicious dinner! I hope you enjoyed it! Thank you so much Martha! Love your show and thanks so much for sharing ! Thanks again for another amazing recipe! Happy holidays to you too Maggie! Thank you so much Celeste! I can’t wait to try make this salad for my family this weekend!! ¡GRACIAS Pati!! This looks wonderful and I can’t wait to try it. I love your show and have both cookbooks and have enjoyed them so much. I love to listen to you. My mother, who is now passed away, was from Aguascalientes. I miss her beautiful accent. I absolutely love seeing your travels in Mexico! Thank you! I’m so happy to hear that you love to listen to me…and that it brings back wonderful memories for you. Sending you my best, Gloria! This salad looks wonderful. I can substitute pecans (allergies), but if I can’t find jicama, what can use as a substitute? You can use any nut you like (or leave them out)…and for the jicama you can use green apple or anything raw, watery and crunchy works. ❤️ you your show and your family. Thank you for what you do. Sweet potato/refried beans tamales ARE THE BOMB! I think this salad will pair nicely with them for Christmas dinner!! Have you done capriotada? For several years now on Christmas Eve, our American, southern California family has been having Ensalada de Noche Buena, along with Sopa de Albondigas. Now we have a delicious new recipe to try! We are all enamored of Mexico and its food, and often drive to Ensenada just to have fish tacos at our favorite street stand. (We also love to shop for Mexican ceramics.) I love, love, love your show and salivate over your beautiful kitchen! Thank you for bringing your talent and warmth to us all. What a great Christmas Eve tradition! And I love that you go to Ensenada just for fish tacos…I can relate to that! I have tried many recipes from your cookbook……”PATI’S MEXICAN TABLE”……they came out WONDERFUL!! We do eat lots of fresh salads and this one will be added to my list of “must-make-soon”. I do follow you on PBS whenever I can and I’m going to locate your show on AMAZON. You can never have too much PATI! You have many great recipes and ideas to bring into my kitchen to share with family and friends. Thank you for taking the time to show us how much fun (and tasty too!!) cooking can be. I really enjoy how funny you can be, very natural of you. It’s so nice to see you with your boys and hubby, so cute! Looking forward to your new season in 2018!! Best wishes to you and your family for a wonderful Christmas and a very Happy New Year!! Thank you for such a lovely comment, Dalila! Happy holidays and New Year to you too! The best, I like it very much!!!! Love your show and recipes! Your enthusiasm for the cuisine and sharing traditions are very contagious! I love orange salads and this one looks wonderful. My husband is very persnickety about beets – but I think if I put them in the center of the platter, as you suggested, he can avoid them. I am going to serve this as my first course for my Christmas Eve dinner. Do you think this can be made ahead – perhaps everything but slicing the oranges? I have been enjoying your show for years. Thank you for introducing us to the wonders of Mexico and its cuisine! Absolutely! You can cook the beets and make the cartelized peanuts and dressing before hand and then dress it all when you are ready to serve. I’m always trying to get my family to eat more fresh fruits and veggies, especially salads – and this one was a big hit! Everybody liked it. Thank-you for this recipe. I will be serving it at Christmas this year. My nephew (in-law) is from Rio Blanco, Vera Cruz and his mother and brother are coming here (north side if Chicago) for Christmas. I’m very excited because I will be cooking with her and learn from her (as I learn from you). I think I will surprise them and make this for Christmas dinner! Gracias y Felize Navidad Y Prospero Ano Nuevo to you and your lovely family!! Have a great time with your family! Happy holidays and have a great New Year! the fabulous cuisine of your country. What a lovely comment! Thank you Jan! This looks fantastic! I love all the color! I believe I will attempt this for Christmas dinner. Thank you for all your inspiration and wonderful recipes! made a variation last night, you are right everyone loved it ! That’s awesome that you made it your own…it sounds super yum! Feliz Navidad and thanks for the great yummy cheer! What is the other ingredient pictured but not mentioned in the recipe? Everything is there…beets (gold and red), peanuts, jicama, and oranges! I asked the same in a different way — but assume you mean the golden fruit looking ingredient. Pati answered that this is “golden beets”. I just saw the response now, but definitely will try this. Pretty. delicious, and nutritious. What more could we ask for! It sounds soo delicious, you bet I am going t make it for Christmas or whenever! The only problem is finding sweet crunchy and delicious young Jicamas here in the DC area…..I grew up in El Salvador eating fresh from the fields Jicamas. Gracias por tu programa, me encanta verte cocinando comida mexicana y visitando México. En la foto de la ensalada puedo ver la jícama, el betabel, la naranja y los cacahuates. Pero se ve otro vegetal más pequeño de color amarillo obscuro, ¿qué son, son otra clase de betabeles? Me encantaría prepararla ya que soy de la Ciudad de México y todas estas tradiciones me acercan a mi amado país. Feliz Navidad para ti y los tuyos. Sí son otra clase de betabeles! Felices fiestas! Love your show – thank yu. Looks like a great recipe and will make it at Christmas! I recently started watching your show and love it. My husband is Mexican-American from San Antonio and his mother taught me to cook her way of Mexican food and even gave me a molcajete which I use to grind the comino seeds and garlic for some of his favorite dishes. But I love the way you cook and the recipes you create on your show, as well as explanation of them with the Mexican culture. By the way, I did make your dulce de leche cinnamon rolls and they were a hit!! Now, if I just had the courage to make tamales! Looking forward to watching more of your shows! Feliz Navidad Pati! I’m so glad you started watching! And I know you can make tamales…just go for it! Hi Pati, This salad looks delicious, I’m going to serve it Christmas Day. Love your show, especially when your boys are in the kitchen with you. Wishing you and your family a wonderful Christmas! I love when my boys are in the kitchen with me too :). Have a happy holiday and a food and fun filled 2018! Merry Christmas to you and your darling boys! (And husband, too.) 😊 I never miss your show. The joy you put into your cooking is as wonderful as the recipes you prepare. Thank you! And happy holidays and have a wonderful 2018! How do you caramalize peanuts? I love your show and enjoy your recipes. This salad sounds yummy and it fits my vegetarian lifestyle, thank you so much Pati. Pati, thank you so much for the delicious recipes, history of the dish and for letting us into your home and Mexico! Feliz Navidad. Have a Very Merry Christmas and a Happy New Year. Thank YOU for letting me into your home! Happy holidays and have a happy 2018! This salad looks deliscious and easy to make. I will make it this Christmas. Thank you Pati. I love your show. I will have to watch on Amazon. We don’t eat GMO and beets are on that list. What can I substitute the beets with? Also because we don’t use vegetable oil, I will substitute that for sunflower oil. Much better for you. Thanks Patti. I love watching you and hearing from you. Any other root vegetable you like! That recipe sounds wonderful! I’m going to try it! Thank you so much Maria Elena! And Merry Christmas to you too. This sounds delicious. I will probably substitute other pecans rather than peanuts which are not a favorite. Oh yes…please adapt to your taste…and enjoy! Love your cooking shows, love Mexican food, and your beautiful family. My oldest daughter is a quarter Mexican, her father was half she is a Martinez but she don’t know Spanish lol I’m half Filipina and white from California but now live in NY. I learned a lot of Spanish friends and school my favorite food is Mexican. I hope to try tamales soon. I love your show!!! Thank you so much for sharing, Melanie! Your Ensalada de Navidad looks so appetizing and I want to try it for Christmas Eve guests. But, there is an ingredient in the photo that doesn’t seem to be included in the recipe. See between 1 and 2 o’clock on the silver plate in the photo. Looks like a small fruit of some kind. Please advise what that is and if it is essential to the recipe. Thank you so much … can’t wait to try this!! Those are golden beets…you can use red or gold beets (or whatever you can find). I hope you and all your guest enjoy the salad!